Home Uncategorized Will L.A. Dump Wells Fargo Over the Dakota Access Pipeline? Will L.A. Dump Wells Fargo Over the Dakota Access Pipeline? Earlier this month, around 1,500 protesters gathered downtown in response to President Trump’s executive order to renew construction on the Dakota Access pipeline—you know, that massive crude oil pipeline being built from North Dakota to Illinois that will pass under a river near the Standing Rock Sioux reservation and has resulted in all sorts of tumult. Protesters camped out for months (and months), people got shot with rubber bullets, the National Guard came in, Jill Stein tagged a bulldozer, Obama put the project on hold, Trump said go ahead, and barely a week ago the Army Corps of Engineers gave it final approval. In the face of the DAPL’s construction, opponents have launched a movement to divest money from the 17 banks financing the pipeline—among them, Wells Fargo, which loaned around $120 million to the project. A local group, Revolution LA, is circulating a “DivestLA” petition (it currently has 1,213 signatures) urging Los Angeles to join the movement and close its accounts with Wells Fargo. “We want Los Angeles City Council to pass an ordinance to end the city’s current relationship with Wells Fargo, and amend the current Responsible Banking Ordinance (RBO) to include stronger social and environmental criteria when considering banking contracts,” the group wrote in a statement. If L.A. were to do so, it wouldn’t be the first. Seattle’s city council unanimously voted to divest its $3 million in annual cash flow from Wells Fargo, and the city of Davis also voted to take its $124 million elsewhere. 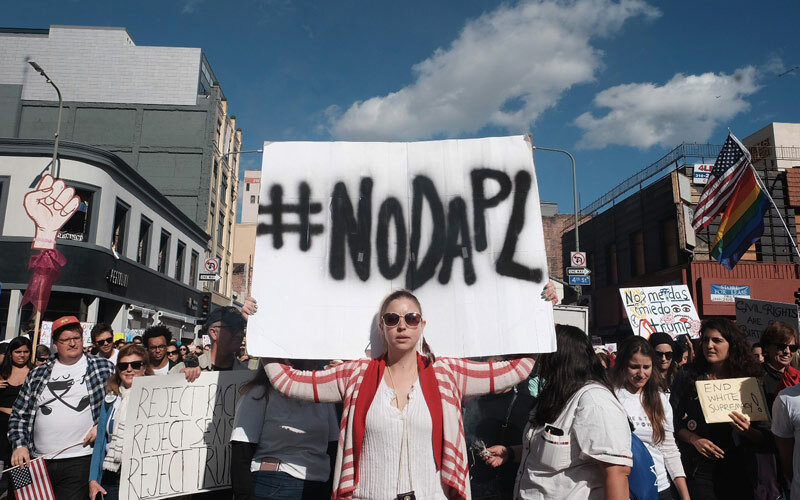 Last week the city of Santa Monica got the divestment ball rolling, voting to pull all city funds—$1 billion in annual transactions and $4.6 million in bonds—from Wells Fargo “due to their involvement in financing the Dakota Access Pipeline and their other misleading business practices,” per a press release. West Hollywood Mayor Lauren Meister is similarly pushing her city to distance itself from Wells Fargo, and the Alameda City Council will meet tonight to discuss parting ways with the bank. There’s a chance the entire state could do the same with the assets in its biggest public employee retirement funds (those are CalSTRS and CalPERS for all you acronym fans out there), though the L.A. Times has argued that the move is deeply ill-conceived. In Los Angeles, neither Mayor Eric Garcetti nor the City Council have addressed the possibility of cutting ties with Wells Fargo. Revolution LA is hosting an organizing meeting this Saturday to articulate their strategy for pressuring L.A. City Hall to divest from DAPL.